Equine Water Treadmills are a very cost effective method of pretraining the thoroughbred racehorse. Four weeks of training on Bambrys Water Treadmill has been proven to be equivalent to at least 6 weeks of conventional training. This saving owners hundreds of dollars in getting their horses to the race track. We have also proven that once the racehorse is race fit we can maintain that fitness while the horse is freshening his mind or recovering from a slight injury. This instead of going out for a spell saving the owners hundreds if not thousands of dollars that would be needed to bring a horse back up to race fitness. Human athletes do not go and lay on a couch for 8 weeks when resting between races. They keep ticking over with light exercise. Long easy walking also fosters a love of exercise and a positive work ethic. By manipulating the speed of the treadmill belt and the gait of the horse, the horse can be encouraged to take longer slower strides at a walk, therefore stretching muscles and training to brain to remember the modified gait. Allows bleeders to heal while still maintaining conditioning. 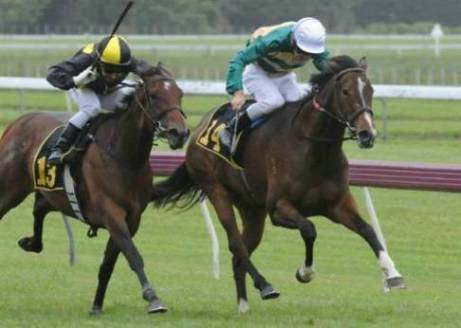 The Francis Finnegan trained 3yr Storm Creek filly pulled off a very gutsy Group 1 Win in the 2009 Levin Classic. EILEEN DUBH was a regular to the Manawatu Equine Water Treadmill for pretraining and also used this facility throughout her race day preparation.
' GET THE GROUP 1 RESULT - Mangatiti Bloodstock are proud to announce their new venture that is currently up and running.Horses are weighed regularly to moniter their progress. If you are interested in more information please do not hestitate to contact us.